INSEE Cement or Siam City Cement (Lanka) Limited, is a member of the Siam City Cement Public Company Limited (SCCC), a leading cement manufacturer in Southeast Asia, founded in 1969 in Thailand. 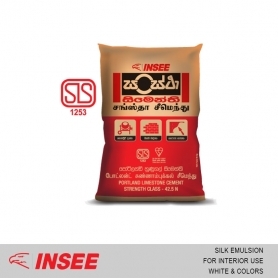 The Company – INSEE Cement, manufactures INSEE branded - Sanstha, Mahaweli Marine, Mahaweli Marine Plus, INSEE Rapid Flow, INSEE Rapid Flow Plus and INSEE Extra cement. INSEE Cement is the first certified ‘Green Cement’ in Sri Lanka with the Green Labeling certification awarded by the Green Building Council. The company is the only fully integrated cement manufacturer in Sri Lanka. The parent company - Siam City Cement Public Company Limited (SCCC) has adapted and progressed to serve the construction needs of the region; its cement manufacturing facility in Saraburi, Thailand, is the world’s largest cement production complex. SCCC manufactures INSEE branded cement, Ready-Mix Concrete, construction aggregates and solutions to serve a widespread regional market that includes Cambodia, Bangladesh, Vietnam, Indonesia and Thailand, in addition to Sri Lanka. SCCC draws from the accumulated expertise and knowledge over decades of operation, and is strongly focused on investing in rapidly advancing regional markets such as Sri Lanka, which show much p romise in sustainable construction. Today, as Sri Lanka’s sole cement manufacturer, it operates three key local facilities in Puttalam, Galle and Colombo. The Puttalam Cement Plant is the only fully integrated cement manufacturing plant in Sri Lanka, and the grinding plant is located in Galle port offering fresh cement, with higher strength and consistent in quality to the market.